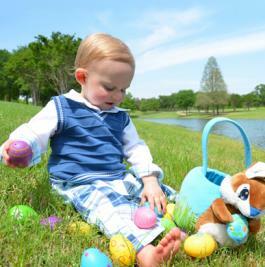 There are a variety of Easter outfits that can make your little man look as handsome as a prince. Easter outfits for little boys can range from casual to formal. The best outfits look great for Easter activities, but can also be used for more than one occasion to help you get the most value for your money. Boutique Collection: Found on Amazon, this retail offers a cute 3-piece sweater vest set that comes with the vest, shirt and pants. Your little fellow will look perfectly coordinated for your celebration. The set is available in infant sizes 12 to 24 months, and is sells for about $40. Children's Place: This retailer has both an online site and retail stores across the USA. You can find baby boy clothing in sizes 3 months to 12 - 18 months in both classic and trendy styles. Some choices that are ideal for Easter include a preppy looking sweater vest for under $20. Dress Me Up Cute: This retailer is found on Amazon and offers an adorable knickers set which make a darling Easter outfit. 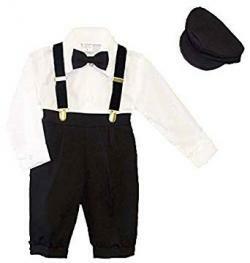 The set includes a button down shirt done in white, pants, a bowtie, suspenders and cap. It is priced around $40. Macy's: You can shop online or at a retail location for a variety of cute outfits by brands such as Nautica and Lauren Madison that are ideal for Easter. 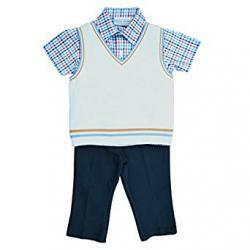 Available in sizes 0 to 24 months, the Nautica 4-Piece vest set (pictured) includes a pair of gray elastic waist dress pants, a blue dress shirt, a vest and a tie for around $50. This suit is easy to put on your baby boy and will have him looking stylish no matter where he wears it. You can also find a baby tux from Lauren Madison for around $65 that includes a tie, jacket, pants, shirt and bonnet. This tux is listed as a Christening suit, but it will work just as well for Easter. 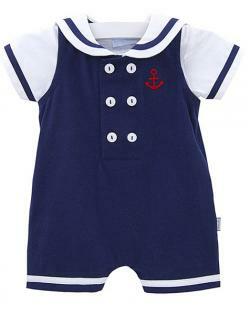 Grammies Attic: At this site, you can find sailor suits for baby boys in sizes 0 to 24 months. For something unique, consider the Petit Ami sailor suit done in navy blue cotton featuring white trim and a white crisp collar as well as a bright red tie. This suit is priced around $45 and will look great for Easter pictures as well as seasonal gatherings. Best Dressed Child: This site offers a selection of cute sailor outfits for babies in sizes newborn to 24 months from designers such as Le Top, Sarah Louise and Jack & Teddy. Sailor outfits come in both one and two piece designs. One stylish option to consider is the Le Top nautical outfit (pictured) priced at $40. This outfit is a navy blue romper with white sleeves and collar. It features six buttons as details on the front and a cute little red anchor on the chest. This style is effortless since it is done in a one-piece style making it possible to dress your little one in minutes and head out the door to your Easter activities. OshKosh: This site carries shortalls for boys in sizes newborn to toddler and in durable cotton and denim fabrics. You can find styles like these Dinosaur Schiffli canvas shortalls which would look perfect with almost any shirt. 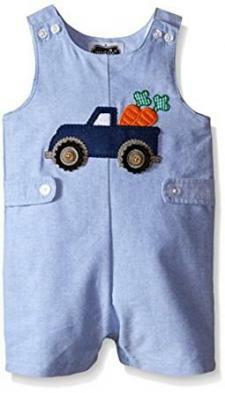 Amazon: This online giant features unique shortalls for baby boys such as a Easter Truck Shortall from Mud Pie. All styles are done in a light, comfortable fabric making them ideal for infants to wear. Styles come in a wide range of price points, so there's something affordable for every baby boy. When choosing an outfit your little boy, always consider what activities you'll be involved in on or around Easter. Will you be out all day long with your infant? If so, you'll want to choose an outfit that is very comfortable or you might wind up with a cranky baby on your hands. On the other hand, if you just want an outfit that will wow your fellow church members or your friends at a party, you may want to go for the cuteness factor. Whatever style you choose, be sure to take plenty of pictures to capture the special moments of your child's first Easter.